There’s been interest from all over the country in the first ever National Onion Hanking Championships which took place at the Grand Finale Harvest Picnic. Participants were able to buy their onions, all locally grown by organic Riversfield and hank them for their winter store and enter into the championships. Hanking is the practice of plaiting onions to hang and store them over the winter (still practiced on Irish farms but also commonplace in Normandy). 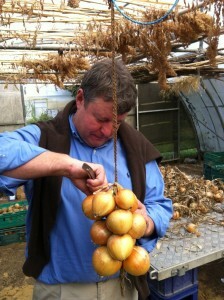 A good hank is one where the lowest hanging onion can be taken from the plait without disturbing the rest. Participants must remember the three good onion hanking qualifications Number one: substantial with lots of onions. Secondly, the hank must be durable so that it doesn’t fall apart and lastly it must be visually appealing .